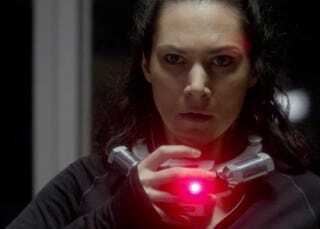 Friday night's episode of Helix is the penultimate one for the series, so by all rights it should have been packed with intriguing reveals and asskicking. Instead it was just kind of awkward and meandering. Spoilers ahead. Let's get our biggest disappointment out of the way first. For the entire series, Hiroshi has been making heartfelt promises to his long-lost daughter Julia that he will tell her everything about who he is, the silver eye thing, the Ilaria plan, all that. And instead of the scene we've been waiting for, it turns out that their whole "reveal" conversation happened off screen! All we get out of it is this awkward, weird conversation between Julia and newly-minted silver eye Sarah. So, OK, now we know they are disease-free and will live forever looking like they are in their twenties. Plus, Hiroshi was born in 1501! Oh and also, we learn in another one of these awkward "Hiroshi told me" scenes that Hiroshi made the virus as a "gift" to humanity. Wait, what? We're just supposed to take this stuff as given now? Without ever seeing for ourselves this whole scene we've been waiting for all season? First, how is the zombie virus a gift to humanity? I'm sure we'll find out next week in some casual conversation between Alan and Peter, as they make light patter about how hard it is to get that black goo out of your Patagonia jacket. Second, how did Hiroshi have access to the immortality technology back in the sixteenth century? What is the Ilaria council? Why are some silver eyes born but others can apparently be made pretty easily? Are we talking aliens, vampires, or mutants? That seems like a pretty important detail to just tuck away into a conversation that ends with a joke about how old Hiroshi looks. Meanwhile, we get full revelation treatment for Scythe revealing that Constance was his mom — which, did anybody really care about that? I thought he was better as a superhuman soldier. He didn't need any motivation beyond that. Then we have a long, looooooooong scene where Scythe tortures Hiroshi by forcing him into a Sophie's Choice between Miksa and Julia. And then Miksa offs himself in the most inexplicable death scene ever. All along Hiroshi could have just kicked Scythe in the head and turned off the "iBehead" application on the Ilaria tablet, as we discover about two seconds after the exploding brains. I would much rather have had a long family discussion about silver eyes between Miksa, Hiroshi and Julia rather than this foolish scenario. Especially when Scythe was supposed to be so badass. Now he's not slicing and dicing, but trying to play psychological games — and that's just not working. Even when he trots out Julia's mom, who has been imprisoned in an ICU box. Meanwhile, the Inuit side of Miksa's family has been told to rendezvous "in Nunavut." Um, isn't Nunavut like a huge province? So meeting there is kind of like meeting in California? I hope they're all able to find each other, and that we can get some satisfaction out of the Ilaria plot next week. At this point, I think the only save that would work for me is if it turns out that this whole season was just setup for a show about a bunch of immortals with super science powers who are living in the shadows and saving the world. IS THAT GOING TO HAPPEN, SHOW? Because if it is, I forgive you.